A 62-year-old man presented with pain in the right hip of 2 weeks. He was a known case of squamous cell carcinoma (SCC) of the right alveolus diagnosed 8 months back, for which he had undergone surgery along with postoperative radiotherapy. An X-ray and computed tomography (CT) study of the hip showed a lytic lesion involving greater trochanter and the diaphyseal region of right femur with destruction of the cortex and showing extracortical soft-tissue component. A CT-guided aspiration and biopsy were done. Meanwhile, the patient was worked up for myeloma, which turned out to be negative. The cytology smears and biopsy showed metastatic SCC. We are reporting this case because distant bone metastasis in the head-and-neck SCC is uncommon. Head-and-neck squamous cell carcinoma (SCC) is known to spread most commonly through the lymphatics. The nonlymphatic spread is rare and is usually known to involve lungs, brain, bones, and skin. The incidence of distant metastasis is mostly influenced by site, tumor size, and nodal status of the primary tumor. Patients with advanced nodal disease, with extranodal spread, and involvement of jugular vein or those patients with extensive soft tissue involvement of SCC in the neck, have increased chance of developing distant metastasis. Distant bone metastases though infrequent should be entertained in the differential diagnosis in any patient with a concurrent or past diagnosis of the head-and-neck carcinoma, who presents with bone lesions. A 62-year-old ma presented to the local hospital in July 2013 with complaints of ulcer of the right cheek and right-sided neck swelling of 2 months duration. He was a chronic smoker and gave a history of pan chewing. Biopsy was taken and with a histopathological diagnosis of SCC patient was referred to our oncology division. On examination, there was an infiltrative lesion measuring 3.5 cm × 1 cm involving right gingivobuccal sulcus and lower alveolus, extending from the first molar with extension to right retromolar trigone. Bone appeared thickened. However, computed tomography (CT) scan showed no erosion of alveolar ridge. The patient opted for surgery followed by radiation. Wide excision with segmental mandibulectomy, right modified radical neck dissection (MRND), and pectoralis major myocutaneous flap was done. Intraoperative frozen section was done to ensure negative margin status. Histopathology showed moderately differentiated SCC with a noncohesive invasive front. Tumor size was 3.5 cm × 1 cm. There was neither perineural invasion nor lymphovascular emboli. Margins of excision were free of neoplasm. The closest margin was the lateral margin with a clearance of 6 mm. One out of three lymph nodes along with the main specimen and one out of 25 lymph nodes of MRND specimen showed metastatic SCC However, there was no extracapsular spread. Decalcified bone section showed no neoplastic infiltration. Thus, the pathological stage of disease was T2N2M0. Postoperative radiation, 60 Gy/30 fr was given. The patient was kept on follow-up. After 8 months of initial diagnosis and treatment, while on follow-up, the patient developed pain in the right hip. There was no evidence of disease at the primary site or neck. The X-ray and CT scan study of the hip showed a lytic lesion involving greater trochanter and diaphyseal region of right femur with destruction of the cortex and showing extracortical soft-tissue component [Figure 1]a and [Figure 1]b. However, there was no fracture. The radiological differential diagnosis included metastasis and myeloma. CT-guided aspiration was negative in the first attempt. The patient was worked up for plasma cell myeloma. Peripheral smear, Bence Jones protein test in urine and serum electrophoresis showed normal study. Aspiration and biopsy were attempted a second time under radiological guidance. The pap-stained smears of the aspirated material showed moderate cellularity. Keratinized atypical squamous cells and keratin pearl formation were seen [Figure 2]a and [Figure 2]b. A diagnosis of metastatic SCC was made. 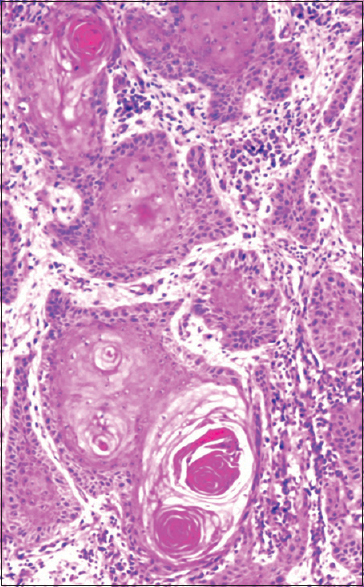 The histopathology study of the biopsy specimen also confirmed the diagnosis [Figure 3]. The patient was managed with palliative radiotherapy (RT), 8 Gy/single fraction. No further active therapy was planned due to poor performance status of the patient. He had good pain relief due to palliative RT; however, he succumbed to his illness in August 2014. SCCs of the head-and-neck region are known to spread most commonly via lymphatics. Primary tumors of advanced T-stages in the hypopharynx, oropharynx, and oral cavity are associated with highest incidence of distant metastases. Our case was T2N2M0 at initial presentation. Distant metastasis is rare and when occurs is most commonly seen in lung, accounting for 66% of distant metastases. In such a situation, it is often difficult to differentiate between the second primary of lung and a metastasis. Other sites of distant metastasis include the brain, skin, and bone. The most important factor determining the probability of distant metastasis is the stage of the tumor at presentation. Larger tumor size, higher grade, positive nodal status, especially with extranodal spread increases the chance of distant metastasis. Other adverse factors include lymphovascular emboli, perineural invasion by tumor, noncohesive invasive front of the neoplasm, etc. Our patient had T2 disease with metastasis to multiple nodes. These adverse factors must have attributed to distant metastasis. With improvement in locoregional control of advanced head-and-neck cancer resulting from new treatment regimens, distant failure has emerged as the most common reason for disease recurrence. Patients with residual or recurrent tumors in the cervical nodes have a high risk of distant metastases. Patients with more than one level of clinical nodal involvement and patients with hypopharyngeal carcinoma have the highest risk of developing distant metastasis and would benefit most from treatment strategies that address the occult distant disease., Our patient had nodal involvement. In a study by Kotwall et al., the lung is the most common site of distant metastases (80%), followed by the mediastinal nodes (34%), the liver (31%), and bone (31%). The initial stage of disease does appear to be related to the ultimate development of the distant metastases. The most extensively studied receptor in the erbB family is the human epidermal growth factor receptor (EGFR), also known as erbB1. Studies have shown that overexpression of EGFR is involved in the development and progression of the head-and-neck SCC. In another study, the authors have reported that heparanase expression correlates with head-and-neck tumor progression. Cytoplasmic staining of heparanase inversely correlates with patient survival and predicts a poor prognosis, whereas nuclear heparanase predicts a favorable outcome. Metastasis to bone is not a common phenomenon of SCC of the head-and-neck region. However, this possibility should always be entertained so as not to miss those rare cases. The axial skeleton is the most common site of bone metastasis involving the spine, pelvis, and ribs frequently. The lumbar spine is the single most frequent site of bone metastasis. In the appendicular skeleton, the proximal femur is the most common site. In our case also metastasis was noted in the proximal femur. In clinically suspicious cases, cytology smears are sufficient to confirm the diagnosis. Only when fine-needle aspiration cytology is inconclusive need biopsies be done for confirming the diagnosis. The overall survival of patients with advanced head-and-neck carcinomas, have increased considerably in recent years due to the availability of newer treatment modalities. However, it should be kept in mind that distant bone metastases though infrequent, considerably reduces the lifespan of patients. Hence, all such patients should be kept under strict follow-up to pick up cases with bone metastasis as early as possible. Bhandari V, Jain RK. A retrospective study of incidence of bone metastasis in head and neck cancer. J Cancer Res Ther 2013;9:90-3. Nishijima W, Takooda S, Tokita N, Takayama S, Sakura M. Analyses of distant metastases in squamous cell carcinoma of the head and neck and lesions above the clavicle at autopsy. Arch Otolaryngol Head Neck Surg 1993;119:65-8. Doweck I, Robbins KT, Vieira F. Analysis of risk factors predictive of distant failure after targeted chemoradiation for advanced head and neck cancer. Arch Otolaryngol Head Neck Surg 2001;127:1315-8. Kotwall C, Sako K, Razack MS, Rao U, Bakamjian V, Shedd DP. Metastatic patterns in squamous cell cancer of the head and neck. Am J Surg 1987;154:439-42. Ford AC, Grandis JR. Targeting epidermal growth factor receptor in head and neck cancer. Head Neck 2003;25:67-73. Doweck I, Kaplan-Cohen V, Naroditsky I, Sabo E, Ilan N, Vlodavsky I. Heparanase localization and expression by head and neck cancer: Correlation with tumor progression and patient survival. Neoplasia 2006;8:1055-61. Eifel PJ, Moughan J, Erickson B, Iarocci T, Grant D, Owen J, et al. Patterns of radiotherapy practice for patients with carcinoma of the uterine cervix: A patterns of care study. Int J Radiat Oncol Biol Phys 2004;60:1144-53.